TIGHT STUFF. As always the racing was close. Johan Kristoffersson (VW), Timmy Hansen (Peugeot) and Andreas Bakkerud (Audi) fight for position in a semifinal race. From lowly 16th place, he rocketed up the leaderboard and won the event in style. Already crowned 2018 champion, Johan Kristoffersson powered his PSRX Volkswagen Polo R to his 11th win in the 12-round World Rallycross Championship held at the Killarney International Raceway at the weekend. From a lowly 16th place after the first qualifying race, the Swede rocketed up the leaderboard, winning the next three heats and his semifinal event. Saturday’s first qualifying race saw nine-time World Rally Champion Sebastian Loeb heading a one-two lockout for Team Peugeot Total, ending 0.02 seconds ahead of teammate Timmy Hansen. Andreas Bakkerud (EKS Audi) edged Petter Solberg (VW Polo) in third and fourth places. Meanwhile Kristoffersson’s Volkswagen suffered a suspected broken sideshaft which caused him to spin and drop to 16th in the standings. Volkswagen turned the tables in Q2 with Kristoffersson leading teammate Solberg at the top of the timesheets, elevating the Swede to sixth in the overnight rankings. Ekstrom and Hansen were next up, followed by Bakkerud and Loeb. The WRC Peugeot star ended Saturday in the lead, with Solberg and Hansen tied on points in second place overall. Yesterday’s first race saw Kristoffersson leap into second place in the overall standings after setting the quickest time of the weekend, with Loeb in second place. Timmy Hansen ended 0.4 seconds ahead of Solberg, followed by the Audis of Ekstrom and Bakkerud. Kevin Hansen, Timur Timerzyanov, Anton Marklund (Renault Megane RS) and Timo Scheider (Seat) rounded out the top 10. The final qualifying race was a humdinger. Off the line, Solberg moved over on Hansen, who jinked into Loeb, in turn tapping Kristoffersson sideways. Piling into the first corner, Kristoffersson held the lead from Ekstrom’s Audi. Solberg then squeezed the two Peugeot drivers and took second but Ekstrom, going around the outside, got hung out and dropped to last. Kristoffersson and Loeb fought hard; Loeb blinked first, allowing Hansen into second. With the VW and Hansen tussling on the last lap, Kristoffersson emerged in the lead from Loeb and Hansen. That meant Kristofferson, from a bleak start, took the event’s overall lead from Loeb and Hansen. The top 12 qualifiers moved on to the pair of semifinal races. Kristofferson won semi one, followed by the Hansen brothers Timmy and Kevin. Solberg took line honours in semi two from Loeb and Ekstrom. Andreas Bakkerud crashed out of his race, ending any hope of finishing second in the overall championship standings. The final saw both Volkswagens in the lead, Kristofferson ahead of Solberg, followed by Ekstrom and the trio of Peugeots. On lap two, Solberg spun into the wall and was collected by Timmy Hansen, causing both to retire. Double world champion Kristoffersson ran out an easy winner, 2.7 seconds ahead of Ekstrom with Loeb in third. 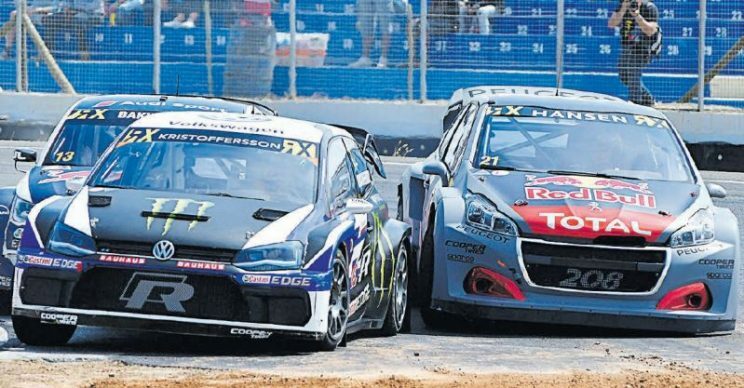 The RX2 Championship fizzled out when Guillaume de Ridder was pushed off the start line in his semifinal race with a mechanical issue, while new RX2 Champion Oliver Eriksson failed to finish the final heat.